Although W.B. Yeats was notoriously tone-deaf – as anyone who listens to recitations of his work by Yeats himself will testify – the lyricism of his poetry is almost without compare. Sarah Jerrom not only discovers this, but puts it to extraordinary purpose in The Yeats Project, her (contemporary rendition of) art-song project that has, fortuitously, made it to disc thanks to the support of a crowd-funding programme. From acknowledgements on the packaging a debt is owed also to Brock University’s Centre For The Arts, Array Music, an organisation that supports ‘the contemporary Canadian musical arts within an international, interdisciplinary context’ the Toronto Downtown Jazz (Discovery Series) and TD Downtown Jazz’s Artistic Director, Josh Grossman, who also happens to have founded the Toronto Jazz Orchestra; together with a group of musicians – including those who perform on this album. Why is this worth noting? In hockey-mad Canada – especially hockey-mad Toronto, there is still an audience for classical and contemporary music, including opera and – yes ballet, opera and lieder/art-song – even when it is created in in the language and realm of improvised music. Moreover, this is not something ‘fringe’ as one would have thought. 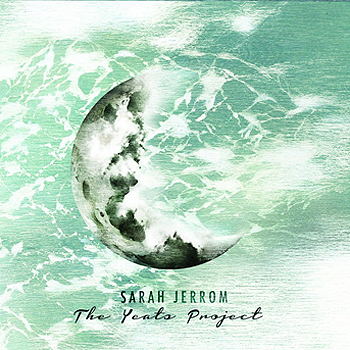 Still, to have to resort to crowd-funding, despite the growth of even the so-called ‘boutique’ label is something lamentable as it is indicative of the motive of pure profit as an overriding consideration for something as beautifully artistic as The Yeats Project by Sarah Jerrom. It’s not so difficult to understand, though, when you consider that even boutique labels seem to salivate at the commercial success of (say) hip-hop productions, though the quality of almost all – if not all of them – lack any extraordinary musicality and originality…even poetry. To create a project around an Irish – albeit world-renowned – poet, W.B. Yeats, who wrote at the turn of the 19th century and until the mid-20th century is commendable despite the fact that in all of the arts, poetry almost inevitably draws the shortest straw in all of the arts is very courageous on the part of Sarah Jerrom. But by the same token, judged purely on her performance here Miss Jerrom appears born to do this. Her voice is pristine and high-sprung. She has an innate sense of lyricism and seems not just to dwell in, but is immersed in an enormous palette of the most gorgeous colours. And in an almost eerie twist of fate she is blessed with a quivering vibrato, like Mr Yeats’ recitation voice, which she uses to glide up and down the soprano (and sometimes mezzo-soprano) registers. This she uses to great effect to render the frail, almost ghostly imagery of Mr Yeats poetry. Miss Jerrom is also a very astute and serious musician. This certainly comes through in the majestic work on this album. Except for “She Moves Through the Fair”, which is a traditional Irish song (written probably at the turn of the 19th century but) published in 1909, Sarah Jerrom has writing all of the wonderful music for this album and set, quite masterfully, the poems of Mr Yeats to the music. Clearly she also imagined how this would sound and has put together a remarkable chamber group to bring it all to fruition. All of the musicians are drawn from both the classical and contemporary realm and include some of the best-known names in the improvisatory scene. Notable ones are cellist Andrew Downing, flugelhorn player Tara Kannangara, bassist, pianist, Carissa Neufeld, violist Aleksander Gajic, violinist Linnea Thaker, cellist, clarinetist Johnny Griffith and drummer Ernesto Cervini, wonderfully conducted by Tom Richards. However the master-stroke is most definitely delivered by the wraith-like vocals of Sarah Jerrom. Having done so much, though it’s a pity that the W.B. Yeats poems set to music did mot find themselves a part of this package.